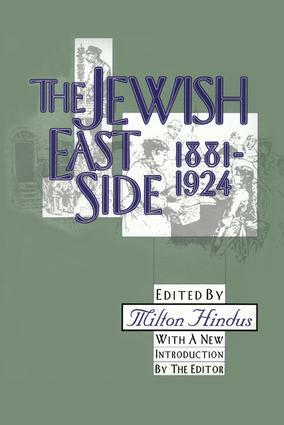 This book, originally published as The Old East Side, is a collection of literature and documents ranging from the autobiography of the sculptor Jacob Epstein and the novels of Abraham Cahan to the reporting of William Dean Howells and the fictional reconstruction of a vanished world by Henry Roth. The world is that of the old shtetl transplanted to a new, growing country, where "the ghetto" (in the years 1881-1924) was an unstable mixture of nostalgic elements and the pressures of American economic and social reality. The productivity, both intellectual and material, of the section of New York known as the East Side during those forty years around the turn of the twentieth century has become a legend among many Jews in this country and deserves to become better known to many more of other ethnic origins. The lower East Side was paradoxically a wilderness to be traversed and a portion of that "promised land" which had been glimpsed with so much hope from afar. To wonderfully talented and observant children, like Jacob Epstein, the streets there in the 1880s were as filled with excitement as those of the Arabian Nights. To serious philosophic young men like Morris Raphael Cohen, they were as challenging as the marketplace of Athens had once been to Socrates to achieve intellectual enlightenment and the improvement of the social order. The conditions of abominable crowding and poverty described in the sociological tracts of Jacob Riis, Lillian Wald, and others are better known perhaps to the average reader than the accounts of such pleasures as the dancing schools, the Yiddish theaters, the cafes, the lectures, the literary ferment and activities, described in the pages of Abraham Cahan and Hutchins Hapgood. But all the views presented in The Jewish East Side, both dark and bright, are recognizably parts of the same picture. This book will be of value to sociologists, historians, researchers specializing in Judaic studies, and students of literature.